The Lovato RGK Remote Access Device range allows for remote control supervision and viewing of any associated Lovato Automatic Mains Failure Generator Controllers. The user operates the remote display panel as if directly in front of the generating set. The robust construction and IP65 rating of the remote access devices ensures that generator monitoring and control can be performed at any time regardless of the weather. The RGK RA remote display unit has a built in buzzer and allows for the viewing of alarm conditions remotely, and the activation of alarm silencing. – 12/24VDC battery power supply. – Graphic LCD with backlight: 128×80 pixels (RGK800…), 128×112 pixels (RGK900…). – 13 function and setting keys. – 10 indications LEDs for operating modes and status. – Conductor cross section: 0.2…2.5mm^2 (24…12 AWG; 18…12 AWG per UL/CSA). – Tightening Torque: 0.56Nm (4.5lbin). – Front degree of protection: IEC IP65; UL/CSA Type 4X outdoor enclosure installation. – Serial interface ports: opto-isolated RS485 (RGK…RD); CANbus-J1979 (RGK…SA). – Dual 100-240VAC / 12-24VDC power supply. – Touch screen 120×112 pixel backlight graphic LCD. – Static (SSR) output for global alarm signalling. – Opto-isolated RS485 interface port. – Front degree of protection: IEC IP54; UL Type 1. RGK800RDSA Remote display panel for RGK 800SA, 12/24VDC, IP65 protection degree, 0.820kg. 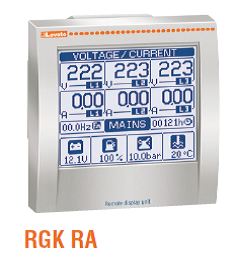 RGK800RD Remote display panel for RGK800, 12/24VDC, IP65 protection degree, 0.820kg. RGK900RDSA Remote display panel for RGK900SA, 12/24VDC, IP65 protection degree, 0.980kg. 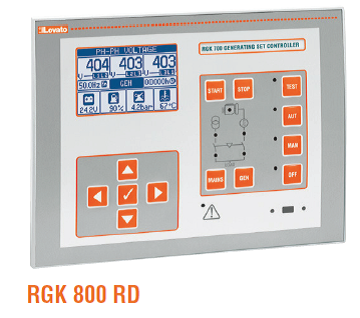 RGK900RD Remote display panel for RGK900, 12/24VDC, IP65 protection degree, 0.980kg. RGKRA Remote display unit, graphic LCD, touch screen 128×112 pixels, IP54 protection degree, 0.360kg.